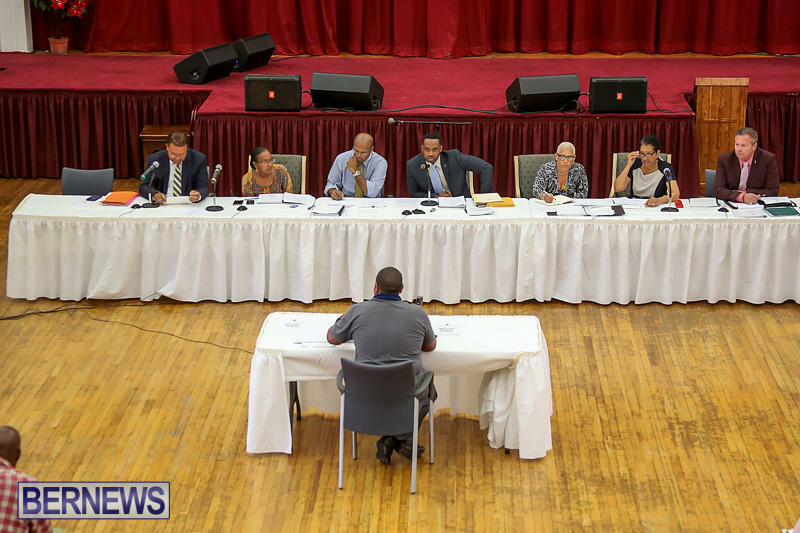 Financial secretary Anthony Manders appeared before the Parliamentary Standing Committee on the Public Accounts during their Public Hearing held yesterday [May 26] at St. Paul in Hamilton. 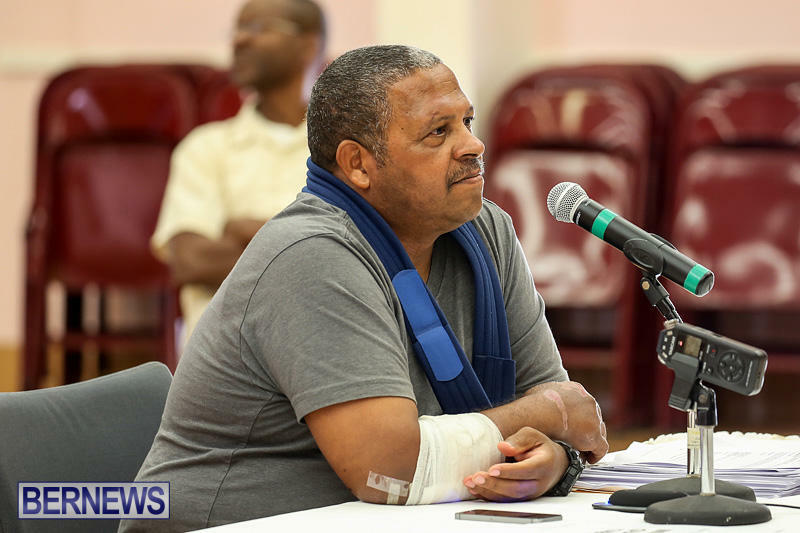 Mr Manders was questioned about Financial Instructions, and various aspects of the Airport Redevelopment Agreement between the Government and the Canadian Commercial Corporation, with his testimony spanning approximately one hour. Also appearing at yesterday’s PAC meeting was former Works and Engineering Minister Derrick Burgess, who discussed various matters including the cost of the Dame Lois Browne Evans court building, the Auditor General’s report and more. We will have the full video of his testimony later on today. Why was this not held in the Senate? Why the grandiose presentation and setting for the seemingly very few in the audience? That’s not the remit of the PAC. That’s the COI’s job. Weird indeed….putting on a show of some kind is Mr Burt… “make it look more important and then people will consider its findings more important….. Distraction from the real investigations. PLP playing mind games with us regular Bermudians me thinks ! He had his own party memebers give evidence as well. See it worked on you already !!!! Burt needs to step down. He is wasting time on the airport matter, which is not even a done deal yet, while spending very little time on “other matters” such as the Lois Browne Evans Building etc. He is the Chairman and directs the agenda. It is a massive conflict and should not be allowed to continue. What makes you say it is not a done deal? The discussion with PAC was very interesting. My question in this matter is as follows: has anyone been to the IMF (International Monetary Fund) website and looked at the recent development and prospect documentation. Thus, because there is so much uncertainty is this the best time to be doing a major capital expenditure. I am not saying not to do it but we need to be sure that this is in the best interest of the Bermudian people and our future generations, who potentially will impacted by taxes if there are short-falls in future potential arrivals. This is a pretty boring circus act! Why is it that MP’s Burt, Furbert and Foggo are unwilling to accept the reasoning being given for rejection of their request? Let’s be real. The only reason that these MP’s want this information prior to the completion of the agreement is so that they can plant more suspicion into the minds of the general public about Aecon and CCC. This is nothing more than a witch hunt! Actually it doesn’t. The PAC can request any and all such documentation from government offices that could be requested in any such legal preceedings that would be before the courts… but the courts cannot so easily disregard NDA’s, so neither can the PAC. They do not have any legal authorities in excess of the the legal court system. After watching the video I can truly say this, the PLP… and in particular Mr. Burt, should never be allowed to represent us in any sort of contractual negotiations, whether international or local. The obvious attempts to flay the FS over answers they already received about high level and on going negotiations and repeatedly ask the same questions from different directions in an obvious attempt to insinuate some sort of foul play, because (as is typical of such negotiations where NDO’s would be in place) they aren’t even legally allowed to get all the information. And I do not believe for an instant that were this be on the other foot, would a PLP government be any more forthcoming and disclosing as they are demanding now. This hypocrisy is first and foremost among the reasoning for my belief of their unfit nature, seconded by the seeming either naïveté or ignorance of the nature of such contractual negotiations would be dangerous positioning for governing officers. 1. Why is Burt acting as though he is a prosecuting attorney in a high profile murder case? 2. Manders is clearly not going to change his stance on most of his responses, especially those that should be asked of his Minister. He is simply doing as he is told.